What’s the worst advice out there about growing your blog or biz? Your content could be magazine-worthy and your products could be genius, but getting people to your site is harder than you ever imagined it would be. Whew do I feel your pain! Let me guess. Does any of these sound like you? You built it, but they aren’t coming. You’re insanely passionate about your blog or business, with dreams of growing a big audience in order to ____(insert your dream goal here). Instead, you’re struggling to get people onto your site at all, not to mention struggling to reach your goals. You hear everyone talking about Pinterest and how it’s sending them traffic in droves, but you just aren’t seeing it for yourself. You’ve followed some tips about Pinterest growth and even implemented some suggestions from like-minded peeps within Facebook groups, but you can’t seem to get the fabled Pinterest traffic you keep hearing about. You’re frustrated with the amount of time you’re spending trying to figure Pinterest out. You’re pinning like a mad woman, reading tutorials left and right, trying every technique under the sun, and following people religiously hoping to boost your traffic. It's exhausting and leaving you less time to write, interact with your community, or even spend time with those who matter to you. You get confused by the conflicting recommendations regarding Pinterest strategies. Are you supposed to delete pins, join a bunch of group boards, and schedule pins? And just how much should you be pinning your content anyway? Is your head nodding yet? Thought so. There’s no need to spin out of control with this stuff. I know it's easy to waste hours trying to figure out a strategy! But if you're on this page, you're unhappy with the traffic you're getting to your website PERIOD. And you're hoping that Pinterest is the answer. Lucky for you, it is. You built it and they DO come. From Pinterest. With a solid understanding of how to get your ideal visitor to click over from Pinterest, they’re coming to your site in droves. And loving what they see. You finally see what the fuss was about with Pinterest. Your traffic is growing every month and you know how to capture seasonal moments for big spikes in traffic. You’ve got more time back in your week and are STILL seeing more traffic. Instead of searching for the golden tip that’s gonna change it all, you have a proven strategy that changed it all. You can spend that extra time writing more kick-booty content, interacting with your community, or spending quality time with those who matter to you. You can move along when you see a bad piece of Pinterest advice (because you now have "bad Pinterest advice radar") and don’t have to waste your time testing it out. No more overthinking and second guessing. You’re a confident Pinterest rock star. That system? 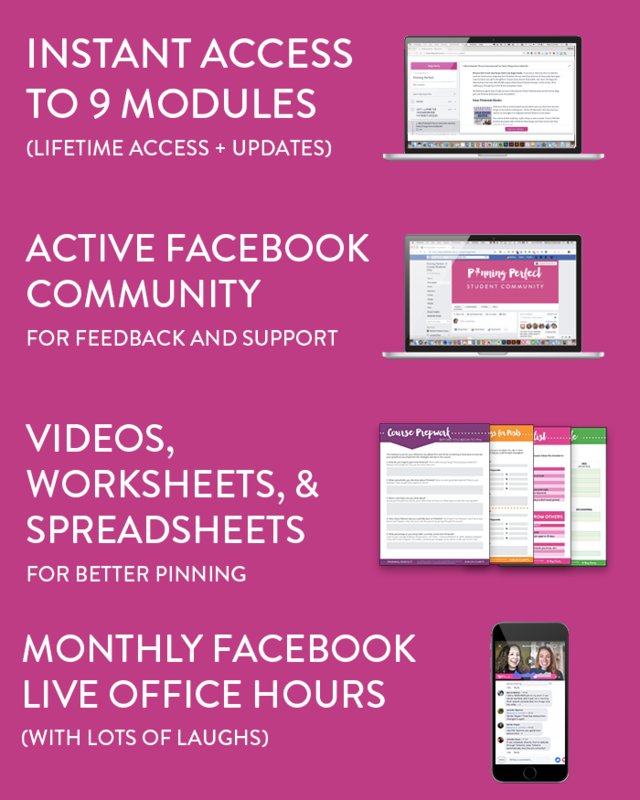 Pinning Perfect, an 9-module online course created for bloggers and small biz owners. It’s time for you to finally learn what all the Pinterest hoopla is about so you can skyrocket your page views and grow your audience. So many bloggers and biz owners either ignore Pinterest entirely (because they don't understand how it can work for them) or treat it like a social media platform. Well, I've got news for you: Pinterest is a search engine. Pinterest doesn't work like a social media platform; it works like a discovery tool. Whereas typical social media platforms are all about sharing your past or present (what you ate today, what you're doing now, and so on), Pinterest is about your future state. Think of Pinterest as not just a search engine, but a search engine that helps you discover ideas, inspiration, and advice for something you want to do, try, or buy in the future. Even if that future is a few minutes from now. You want a chunk of the millions of people searching on Pinterest to discover YOUR content and promptly click over to your site. What do you get in Pinning Perfect? In addition, we have technical tutorials for both WordPress and Blogger users so you get step-by-step instruction along the way. What exactly will you learn in Pinning Perfect? Learn the two slightly techy things you should do before you get started on Pinterest (don’t worry - we show you how). We'll focus in on what matters (and the surprising things that don’t matter) when building your Pinterest profile and cover how the Smart Feed works. With this information, you'll be able to jump right into the course and start working on the things that will start sending you Pinterest traffic. Learn once and for all how to write epic pin descriptions that result in people coming to your website. We show you how to find the right keywords (no, it’s not through Google) as well as a special trick to get the right pin description pinned from your website. If there ever was a part of Pinterest to master, this is it. Create beautiful, best-in-class pins… even if you aren’t a photographer or graphic designer! Learn how to streamline the pin creation process so you aren’t designing pins for hours on end. Plus, we’ll tell you the one thing most people aren’t considering when designing their pins (but should be)! Oh my have boards changed! They aren’t as important to Pinterest users as you think they are, BUT they are important for YOU. Get the inside scoop on boards and what you need to worry about for traffic-driving success. Generating mind-blowing Pinterest traffic isn’t just about getting people to click pins over on Pinterest. It’s about your existing website visitors (or people coming FROM Pinterest) actually pinning your content too. So make it easy for them. That person with 30 followers and a pin icon for a profile image just might send you thousands of page views (yep, we’ve seen it happen). There are a few simple ways that you can quickly and easily create content that will do well on Pinterest, even if you are not an expert in the topic you're writing about. We'll cover them! Everything you do in the course leads up to this: a clear method for pinning that'll drive traffic to your website. Find out how many pins a day you should be pinning (hint: it’s not 100, that’s for sure) and most importantly, what ratio works for pinning your own content versus content from others. Once you know how the strategy works (and why it works), it’s time to implement what you learned in the most efficient way possible. This module covers Tailwind, Tailwind Tribes, and special pinning groups. Take charge with those analytics! We know you hate figuring out what all those number REALLY mean, so we break it down for you. Learn how to use Google Analytics, Pinterest Analytics, and even Tailwind to determine what’s working and what’s not. Plus we show you how to install a cool dashboard and report in Google Analytics to get the most important insights in just a click. 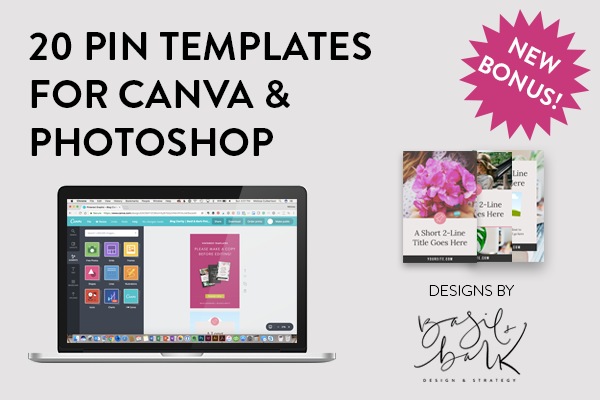 20 Pin Templates in Photoshop and Canva! We are SO excited about offering these to you. Blog Clarity partnered with Basil + Bark to bring Pinning Perfect students TWENTY beautiful pin templates. There are pin templates for 1-3 images plus a few templates for those offering freebies on their website. You also receive a design kit to guide you through using the templates. This will save you so much time! Tailwind and I worked out a deal to give Pinning Perfect students a $30 credit on their Plus plan. That means either an annual plan for $89 or 2 months free- both equal $30 off. 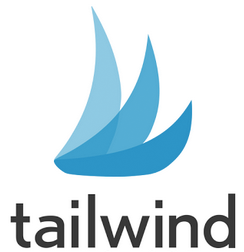 This is for new students who've never signed up for a referral before with Tailwind. Who is Pinning Perfect for? Beginner, intermediate, or advanced bloggers who want more traffic so they can grow their email list, sell more product, or command higher rates when working with brands. Even seasoned bloggers who use Pinterest for business have seen boosts in traffic once they learned these proven strategies. Shop owners who also have blogs that tie into their shops. We have hundreds of Teachers Pay Teachers shop owners in Pinning Perfect and other shop owners too. Many of them with ONLY a shop have been successful too, but the MOST successful ones also have blogs where they provide their target audience with valuable content. Virtual assistants or social media managers for influencers. Give your clients a traffic boost by learning tried-and-true Pinterest strategies. You'll help them grow their audiences, boost their income, and generally find you indispensable. Bloggers and biz owners who aren't sure if Pinterest works for their niche. If you're starting to wonder if Pinterest works just for people who blog about crafts, foods, and home decor, wonder no more. ANYONE can benefit from Pinterest. In fact, in the course we cover ways to turn your existing and new content into something click-worthy, all while staying true to your passion. 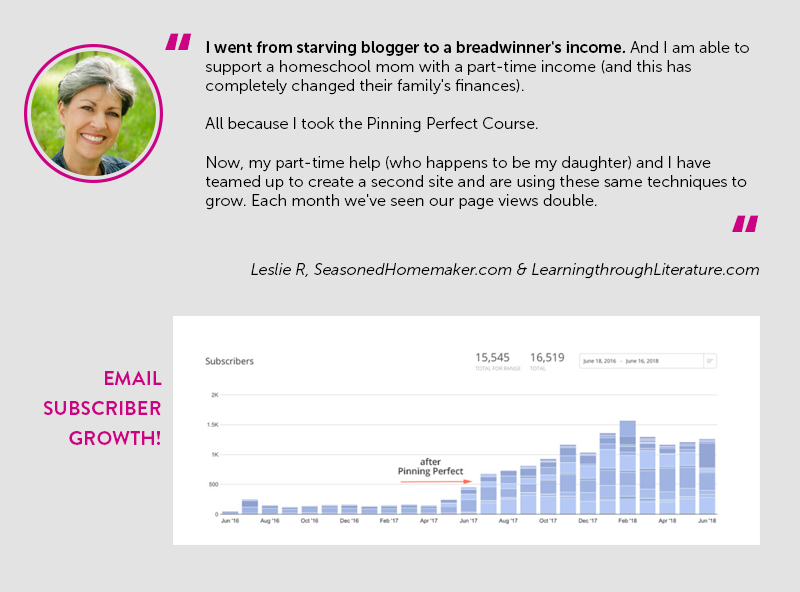 This course isn’t for you if you’re just blogging as a hobby and don’t need the serious growth you could see from Pinterest. Keep saving those recipes, crafts, and other great ideas. You just don't need a strategy for it. This course isn’t for you if you think Pinterest provides instant results. Pinterest is a SEARCH engine. And it can take 3-6 months to see big results. You WILL see them with this course. But not tomorrow. What you WILL see instantly is what makes Pinterest really work for bloggers and small biz owners. Through detailed lessons and videos, you'll be pretty dang giddy about what Pinterest can do. Yep! We don't limit the enrollment to just certain times of the year. You can purchase anytime you'd like and start learning the traffic-driving strategies right away. Ask questions in our private Facebook group at any time; plus we have monthly Facebook Live Q&A as our monthly "office hours." Once you sign up, you'll receive INSTANT access to all the units of the course. Go through them as slow or fast as you'd like. You can mark lessons complete too so it's easy to keep track at where you are in the course content. In addition, every month Anna will hold office hours via Facebook Live in the course Facebook group. That's your chance to ask questions, get feedback, and more in a live setting. Oh, did I mention that you have LIFETIME access to the content? Yep, all course updates too. Even if you don't have these things, you can still sign up! But just know we don't cover these within the course. Do you cover Promoted Pins? No, we prefer to show how you can grow using organic strategies, especially since you're already paying for the course! How does forever sound? Cause that's what you get! Pinterest is always changing. Does the course get updated? Yep, Anna and I update it every six months, plus any minor changes get discussed within the group in between! And students get lifetime access to any updates as well. In fact, I work directly with Pinterest for my day job so we always have the most up-to-date (AND CORRECT) information out there regarding Pinterest. Absolutely! If you take the entire course, implement the strategies, and still don't get results, you can contact me within 30 days of purchase and I'll give you a full refund. Proof of work needs to be shown AND you cannot have downloaded all the bonuses. Can I Find This Info Online for Free? Well, you can string together a bunch of people's strategies and give it a shot, but here's the thing. There's SO MUCH bad advice about Pinterest out there. We see it daily, especially in Facebook groups. From deleting pins (the worst) to thinking more followers equals more traffic, the inaccurate information out there on the interwebs is terrible. Since I work directly with Pinterest for my day job, I get the truths to the myths and always make sure you're in the know. 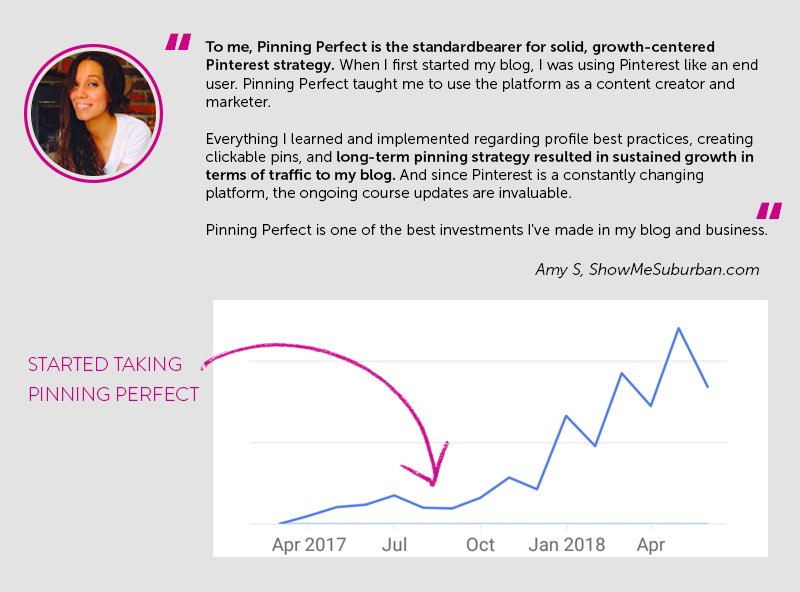 Pinning Perfect is continually updated with the latest best practices and strategies so you don't have to guess if that article you're reading is really going to help you grow. Are you ready for a traffic boost? If you're getting even the least bit excited about right now, then come join us! You'll be psyched when you see the strategy and tactics that REALLY work on Pinterest. I made a silly seal for ya, but the sentiment is real. Thousands of students have followed the Pinning Perfect strategy to get results like WHOA. But if you take the entire course, implement the strategies, and still don’t get results, you can contact me within 30 days of purchase and I’ll give you a full refund. A refund will not be given for people who have downloaded all our handouts and bonuses. She thought about quitting, but instead spent countless hours developing a powerful Pinterest strategy to help her meet her goals. Over the next 12 months, she worked less and saw a 10x increase in site traffic and made over $100,000 between her ad revenue and sponsored work. Now, she spends about an hour a week on Pinterest, makes six figures on sponsored posts alone, makes more in ad revenue than she did in her first two jobs out of college and still has time to teach this course, do consulting work and – you know – spend time with her family and friends. In this course, she’s teaching you all of her secrets to success, so you can do the same! In addition to Anna’s Pinterest prowess, I (that’s Melissa from Blog Clarity) work for a major brand and meet with Pinterest reps regularly. They give us the low-down on Pinterest myths and upcoming changes. As long as it’s not confidential, that insider knowledge gets passed along to students. Enroll now for instant access to all 9 modules and a "room" full of fellow students in our Facebook group. We're ready to show you behind the curtain so you can grow your traffic AND your audience through the looks-like-magic-but-it's-more-like-strategy power of Pinterest. Rather spread out the payments? Pick one of these! Credit Card only.